The AisleCop® Dual Pedestrian Gate System helps protect pedestrians through motion-detection and traffic control of dangerous aisles. 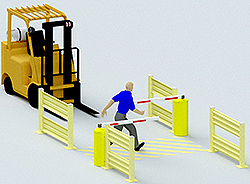 The gates (typically facing each other) help limit pedestrian access to aisles when a forklift or other industrial equipment is present. The gates open and allow pedestrians to cross only after traffic has cleared. To enhance pedestrian safety, flashing lights and an audible alarm are triggered each time the system is activated. Custom control and sensor configurations are available upon request. Guardrail sold separately. System Components: 2 motorized, fully enclosed push button activated pedestrian gates with barrier arms (up to 40-1/2") and red flashing LED lights, 2 forklift motion sensors, 1 pedestrian sensor, control wiring enclosure with key lock panel, and PLC-based control package.